If you watch the evening news on one of the major television networks these days, you've undoubtedly noticed that only one topic frequently beats the presidential election campaign for the lead story. It's the weather. That's saying a lot in one of the craziest presidential election cycles ever. 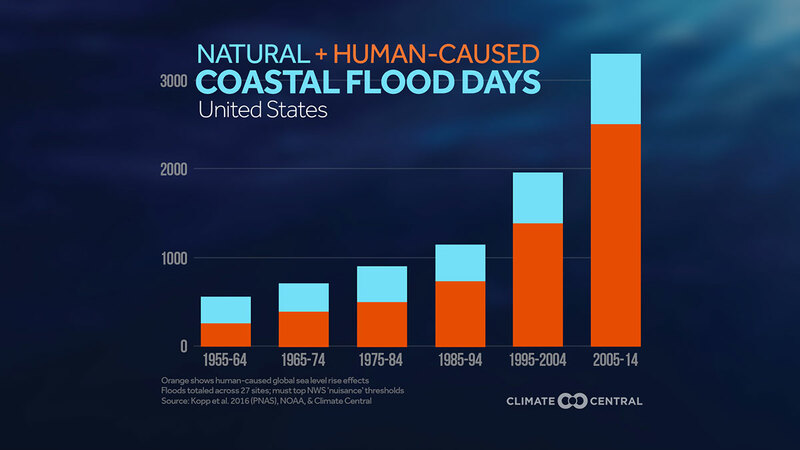 Nevertheless, it seems like barely a day goes by without extreme weather sweeping across huge areas of the country, exposing millions of Americans to brutal storms, tornados and floods that are more intense and occurring earlier than in the past. Yet, while Mother Nature is stealing some of the headlines from Donald Trump, the major networks are missing the real story. They blame this year's extreme weather on the "Godzilla" El Niño. But where is Godzilla getting its strength? If broadcast news scratched beneath the surface of this Niño, it would find global climate change. The media don't have to scratch very deep. The connection between climate change and extreme weather disasters has been in the scientific literature for years. There still are plenty of questions for scientists to investigate -- for example, whether the frequency, strength and timing of tornadoes have a climate connection. But many of the weather extremes today are consistent with the longstanding projections of climate science. Three years ago, for example, the journal Science published research from the Georgia Institute of Technology that El Niños appear to get stronger as the level of carbon dioxide in the atmosphere increases. Like hurricanes, El Niños get their power from warm ocean waters, and the world's oceans absorb 90% of the heat from global warming. As the Guardian reported last July, government scientists in the United States have concluded "the warming of the oceans due to climate change is now unstoppable after record temperatures last year (2014), bringing additional sea-level rise and raising the risks of severe storms." Since that finding, 2015 has taken the title from 2014 as the warmest year on record. Again, it's not that the major networks are giving too little attention to big weather events. David Bauder wrote on Huffington Post a year ago that "over the past five years, the newscasts have essentially doubled the amount of time spent on weather and natural disaster stories" and "weather coverage has more than quadrupled since the early 1990s." But network news is under-reporting the story behind the story. The news media have been criticized about their coverage before. The issue used to be the media's practice of giving equal airtime and column inches to climate deniers when they are so vastly outnumbered by the scientists who conclude that global warming is real. That still seems to be a problem, but the more recent issue is whether climate change is mentioned at all. The organization Fairness and Accuracy in Reporting found that in 2013, the major network news programs aired 450 segments on extreme weather events, but only 16 of the segments mentioned climate change. A new analysis by Media Matters shows that the major networks' coverage of climate change dropped 5% last year despite the historic climate agreement in Paris, the Obama Administration's controversial Clean Power Plan, the Pope's encyclical, the Keystone XL pipeline controversy, the investigation of a climate science cover-up by ExxonMobil and the Obama Administration's climate-critical effort to limit fugitive methane emissions from nature gas operations. And as it turned out, 2015 was not only the hottest year on record; it also was the worst year ever for CO2 pollution. To be sure, the news media's job is usually to report facts, not speculation. The connection between climate change and extreme weather events is no longer speculation, however. Many current weather disasters can no longer be dismissed as unique. As the Center for Climate and Energy Solutions has concluded, "What matters is that there is a statistical record of these events occurring with increasing frequency and/or intensity over time, that this trend is consistent with expectations from global warming, and that our understanding of climate physics indicates that this trend should continue into the future as the world continues to warm." In other words, extreme weather is substantiating decades of scientific study. Global warming is the story behind the stories of the violent and deadly weather we see more and more on the evening news or, unfortunately, in our own communities. If the Republican candidates for president want to cling to their skepticism about or outright denial of global warming, so be it. Voters will be their judges this November. But it is both irrational and irresponsible for any politician today to ignore the risk that climate change is real and to stonewall on what he or she plans to do about that risk before it's too late. As for the news media, the link between weather disasters and global warming, the failure of key political leaders and candidates to acknowledge it, the influence of lucre on their positions, and the likelihood that many of this year's candidates will avoid the issue unless the media and the public insist that they address it - these are big stories with all the conflict and character issues the media usually love. In the news business as in life, there are sins of omission as well as commission. One of them is not paying sufficient attention to what is ultimately the most consequential story of our age. It's time for network news to do its job.